"Whaat? Whaat? 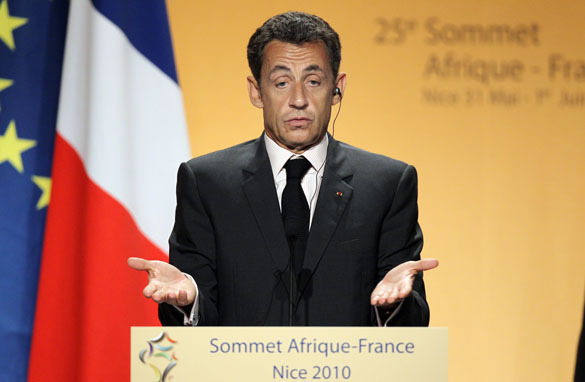 I thought I could keep Tipper chipper better than Monsieur Gore!" "How do you say, 'glad we don't own Louisiana any more?'" 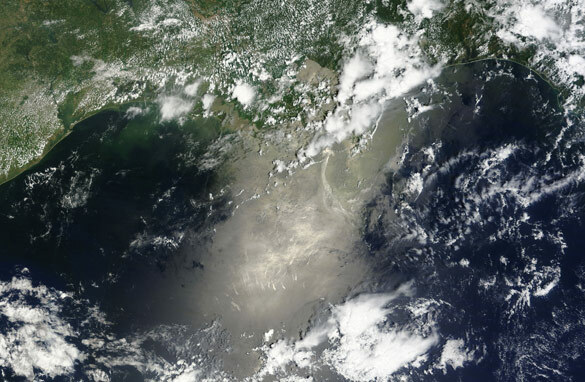 In this NASA handout, the oil slick is seen off the coast of Louisiana with a portion flowing south from the accident site in the Gulf of Mexico. (PHOTO CREDIT: NASA via GETTY IMAGES). Right now in the Gulf, a risky new plan is underway in hopes of finally stopping the oil leak. After the 'top kill' effort failed over the weekend, BP is now hoping the "cut and cap" plan will stop the spill. 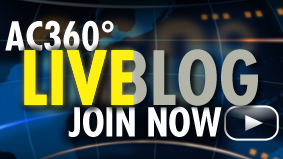 Tonight on 360°, Anderson will report live from the Gulf. He'll give you a look how this new plan is supposed to work. The big question is: Will it work? 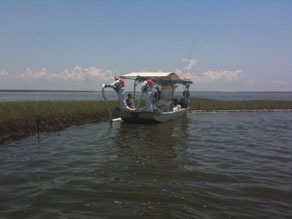 Oil is now washing ashore on the Mississippi and Alabama barrier islands, in addition to those in Louisiana. Meantime, BP CEO Tony Hayward is fueling new rage with a controversial comment over the weekend. "We're sorry for the massive disruption it's caused their lives. There's no one who wants this over more than I do. I would like my life back," Hayward told reports on Sunday. He wants his life back. He made $4.5 million dollars last year. That's more than most people make in a lifetime. We're also tracking the cleanup efforts. Remember Pres. Obama's promise to triple the manpower? Well, what our Gary Tuchman witnessed today is nowhere close to that promise. We're keeping them honest. 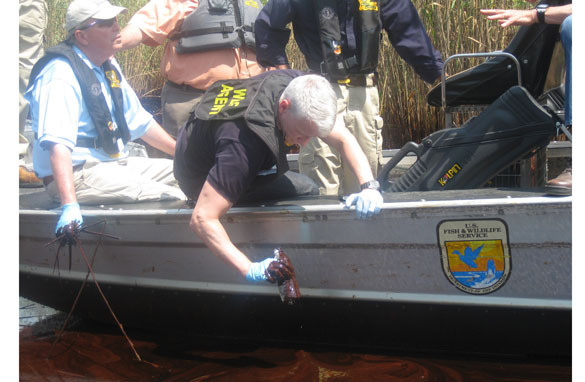 There's also word from the U.S. Justice Department that a criminal investigation has been opened into the Gulf oil spill. Attorney General Eric Holder was in the Gulf area today to see the mess and meet with state attorneys general and federal prosecutors. Holder is promising to prosecute anyone who broke the law. We'll talk over those developments over with CNN's Senior Legal Analyst Jeffrey Toobin. As you see it's a busy night. There are a lot of new developments. Join us for our coverage from New Orleans starting at 10 p.m. ET. See you then. 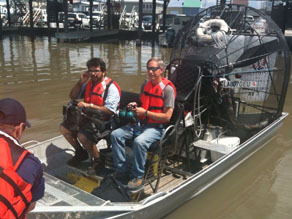 Tonight on 360°, we're keeping them honest along the Gulf coast. Last week, Pres. Obama promised to triple the oil cleanup crews. So, where is that manpower? Wait to you see what Gary Tuchman discovered today. Plus, all the day's developments on the spill. 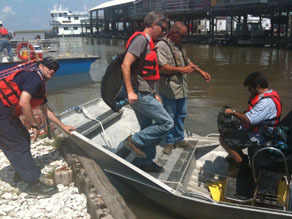 After a weekend at home, I packed my bag and headed back to New Orleans with Anderson to report about the oil spill. When I got to the airport yesterday the TSA agent checking my ID and ticket shook his head as he noticed where I was headed. "Those BP guys have no idea what they're doing down there do they?" I walked toward the gate and grabbed a cup of coffee to keep me awake through my delay. People standing in line at the coffee stand were talking about how this was going to change what we know about the entire Gulf of Mexico. I boarded my flight and the guy next to me wouldn't stop talking about it the entire trip. He was furious and had 10 ideas on how to get the gushing oil to stop. People behind us started to chime in as well. When I got to the hotel the person checking me in also brought it up. She said she tried not to think about it all weekend so she could enjoy her family and relax, but said it's all anyone wanted to talk about since BP announced that their "top kill" efforts had failed. Everyone knows this is a disaster and can't believe it's been so long and it has yet to be stopped. 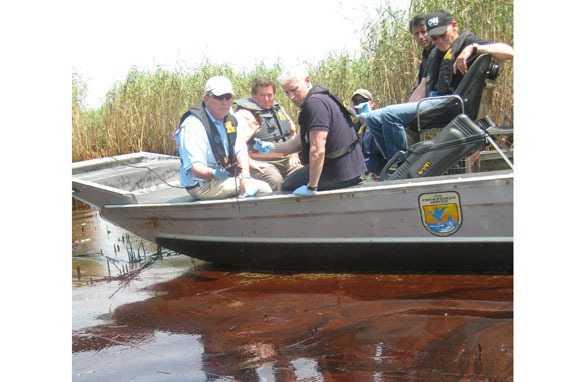 I was personally blown away last week when Anderson and I went to get a closer look at the oil in the marshes. There was oil everywhere. We were literally floating in a pile of brown sludge and I know there is so much more to come. Anderson, Gary Tuchman, producer Joneil Adriano and I along with so many more CNNers will be here reporting all week on the newest efforts to stop the leak and the efforts to clean up the oil. 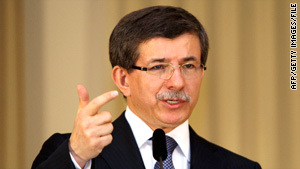 Turkey's foreign minister said Tuesday that his government is "not happy" with the U.S. response to Israel's raid on an aid flotilla carrying humanitarian goods bound for blockaded Gaza. 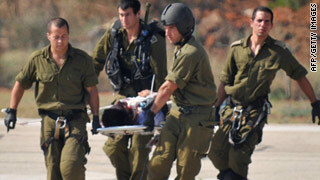 All foreigners who had been aboard a flotilla stormed Monday by Israeli soldiers will be released within 48 hours, the Israeli prime minister's office told CNN Tuesday. Prime Minister Benjamin Netanyahu's office said that the Interior Minister Eli Yishai has been instructed to deport the detainees immediately. Yishi said the deportations would start Tuesday night and likely be completed within 48 hours. 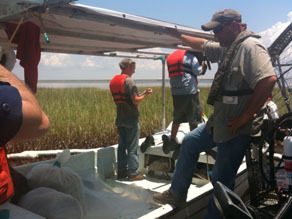 Today, Gary Tuchman visited wetlands affected by the BP oil spill. 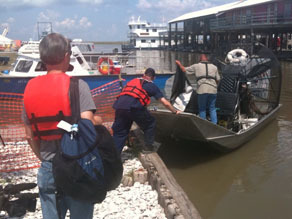 Accompanied by the Coast Guard, he set off on an airboat from Cocadrie, La., a small town about two hours southwest of New Orleans. He saw workers deploying new booms around the marsh. Others were cleaning up previously deployed booms, even individual blades of grass, with a special cleaning rag. It's painstaking work - not to mention dangerous. 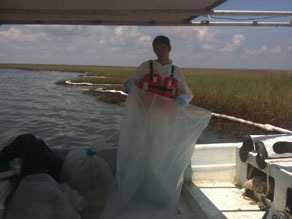 The workers - mostly local contractors hired by BP - must wear protective gloves and suits in this hot, humid weather. 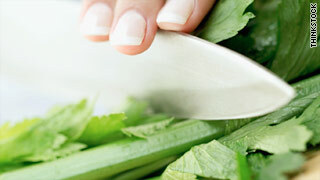 If you're eating non-organic celery today, you may be ingesting 67 pesticides with it. Program Note: Is enough being done to protect us from chemicals that could harm us? Watch "Toxic America," a special two-night investigative report with Sanjay Gupta, M.D., June 2 and 3 at 8 p.m. ET on CNN. Video: Is the cleanup working?